An Evanston Police Department squad car. EPD will begin requiring the use of body cameras for field officers on Friday. 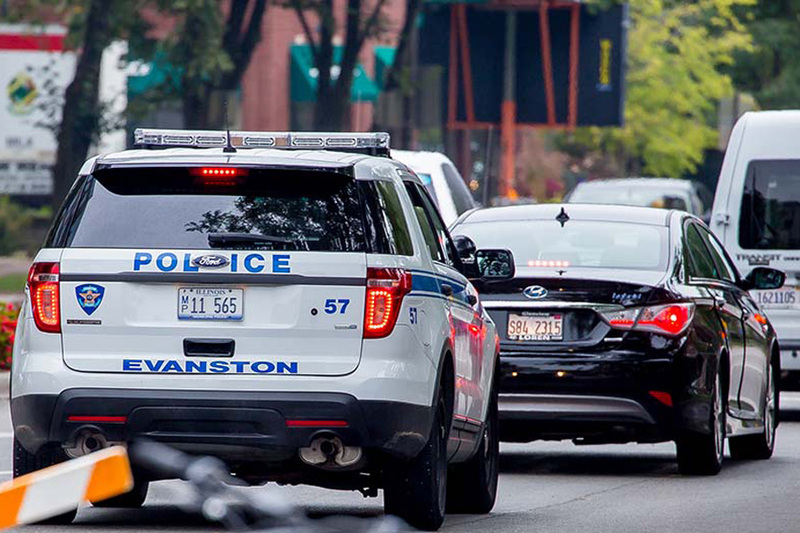 The Evanston Police Department will require all field officers to wear body cameras while on duty beginning Friday. All patrol, community, tactical, narcotics and traffic officers will be required to use the cameras — 120 in total — when working in the field, said Sgt. Jay Parrott, who oversaw the implementation of the body cameras. The cameras will increase accountability and safety for police officers, Parrott said. City manager Wally Bobkiewicz said EPD’s goal is to be one of the most transparent departments in the Chicago area. He added that the cameras will be beneficial both for officers and the general public. Rising tensions between police and citizens nationwide prompted EPD to consider the use of body cameras in 2015. The department decided to seek funding for the cameras and create an implementation plan after Gov. Bruce Rauner legalized their use in August of the same year. Last summer, 11 Evanston officers piloted the body camera program to test “reliability of the equipment and address possible procedural or technical issues,” police Cmdr. Joseph Dugan told The Daily in June. “(The cameras) will improve police transparency and be as much of a benefit to EPD as it is to the citizenry,” Glew said. Parrott said once an officer returns from a shift, they will upload all the recorded footage to a secure cloud. He said the process will help organize footage and ensure its accessibility when necessary. However, he said citizens will only have access to the footage by filing a Freedom of Information Act request, which requires approval from the department. Furthermore, Parrott said if the person arrested does not give their consent, the public cannot have access to the footage. Parrott said the city spent $1.2 million on the five-year contract with Axon, the company that provides the cameras. The contract includes upgraded car cameras, taser weapons and recording equipment for interview rooms as well as storage and insurance for the new technology. Brian Miller, the former 9th Ward alderman, said though he is happy about these improvements and protections, they are just “one piece” of police accountability. Miller pointed to the incident on Monday where officers handcuffed a 60-year-old Evanston man, Gregory Hall, mistaken for an armed robbery suspect. Hall said he told the officers he could not have been a suspect since he was in the Evanston Public Library and told them to ask the librarian for confirmation. Miller said officers have been operating under a policy of “arrest first, ask questions later.” Glew told The Daily Wednesday that two body cameras captured the incident and will be used in a use-of-force investigation. Miller also mentioned the arrest of Iain Bady, a 12-year-old who police took into custody for riding on the back of a bicycle that violated traffic laws last August. Miller said he believes officers were not held accountable.